Following up from our previous blog on the abnormalities in the ventromedial prefrontal cortex (vmPFC) in alcoholics, brain regions which govern emotional regulation, we came across another study which appears to show that adolescents at increased risk for later alcohol use disorders (AUDs) may also be showing an emotion regulation difficulty. This emotional regulation difficulty may be a biomarker for later alcoholism, which is in keeping with our previous proposals that an emotional processing and regulation difficulty or disorder underpins the aetiolgy of of alcoholism. In order words it is part of the pathomechanism – or the mechanism by which a pathological condition occurs- of later alcoholism. The area in this study, the vmPFC, showed relatively increased cerebral blood flow (CBF) in bilateral amygdala and vmPFC and relatively decreased CBF in bilateral insula, right dorsal anterior cingulate cortex (ACC) and occipital lobe cuneus of high-risk adolescents. This suggests that adolescents at relatively high-risk for AUD exhibit altered patterns of resting CBF in distributed corticolimbic regions supporting emotional behaviors. 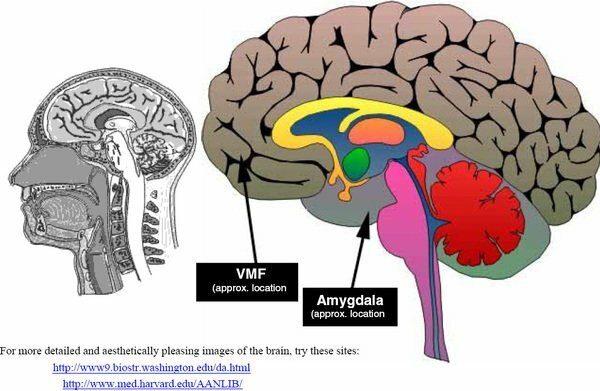 The authors’ hypothesized that the relatively increased amygdala and ventromedial prefrontal CBF may contribute to increased emotional reactivity and sensitivity to environmental stressors in these individuals while diminished insula/occipital cuneus and dorsal anterior cingulate cortex (ACC) CBF may lead to poor integration of visceral and sensory changes accompanying such emotional stress responses and top-down regulation of amygdala reactivity. Thus we see our model in a snapshot even in adolescents potentially. The emotional processing deficits we have discussed previously implicate the insula and ACC, as there appears to be a difficulty in alcoholics in reading emotional or somatic signals/states and integrating these signals into the identifying, labelling and processing of emotions. Equally there appears to be a hyperactivty in the vmPFC and amgydala as with alcoholics which implies emotional dysregulation, a hyper reactive emotional response and a tendency perhaps to a more “fight or flight” response, distress based impulsivity and short termist decision making, wanting it NOW rather than later. Lin, A. L., Glahn, D. C., Hariri, A. R., & Williamson, D. E. (2008). Basal Perfusion in Adolescents at Risk for Alcohol Use Disorders. In Proc. Intl. Soc. Mag. Reson. Med (Vol. 16, p. 60). Happy 4th of July Paul! I will get back to you about the email you sent me about gambling. Sorry, I’ve been so busy with book promotion clients. Interesting about what you said of addiction, “Fear Based Disease” as gambling has the same traits. I say this because my Agoraphobia with Panic disorder is a direct effect from the fear that comes with all types of addictions. The other problem I have is the “Pleasure & Reward” part of my brain is mush from overuse. I was put on Welbutrin to help with that part of my mental disorders. I take a few more meds for the Bipolar Depression & Agoraphobia. Many don’t understand that with any addiction, we deplete brain & body chemicals when you have repetitive action with addiction. Especially with addicted gambling, as we can manipulate all of that in us. It is why we feel and have the same High, Rush, and more when we gamble as a drug addict, alcoholic, …. but the scary part is we don’t have to smoke, snort, drink, or shot a needle in our arm to get the same effects as those other types of addictions. THAT’S the dangerous and scary part od gambling addiction. It’s also why it has the highest Suicide Rate then other addictions. And it is now reaching our young college kids and high school teens. Last report is, of the 17+ million Problem Gamblers in the US alone? Half that is now Teens & College age young adults…..Not Cool! thank you, glad things are going well for you! Happy 4th July to you over there in the US! I hope you are having a fun day. Thanks too for all the great feedback. Gambling disorder is becoming a big problem here with television swamped with gambling adverts just like it used to be with cigarettes and booze, back in the day. It all has an influence, environment of one type or another plays a role s well as genes. One of the main gambling problem seems to centre on fixed odds betting terminals (FOBTs) the “crack cocaine” of gambling. There is I believe similar neurobiological and emotional dysregulation problems with all addictive behaviours (and impulse control problems too) Similar parts of the brain and similar neural mechanisms seem to be involved in many disorders. It is trying to identify vulnerabilities in children and adolescents so that we can better inform prevention as well as treatment of all these disorders. Certain functions of the brain don’t seem to work properly with some folk. I look forward to receiving more of your observations. God Bless, Paul. I have read about the UK & problems with the (FOBT’S)….Now if they really made a difference, wouldn’t more people be a lot richer??….LOL. I had to Google FOBT when I read a little about them in an article. Just like being a card counter in Las Vegas, it still doesn’t make much of a difference, as you still LOSE. I will get to our Email discussion today! the funny thing about the adverts is that it’s still the old masculine, macho BS as before in selling these gambling apps as with the drink and the cigarettes! Ladbrokes, a gambling company here in the UK, is instead trying to sell it’s gambling products as the thinking man’s choice, not the down market moronic motoric type. The betting shops even have this very seductive smell regularly gusted into the shops and you can sit and have coffee, even bring your girlfriend there on the way to the bar, or restaurant. Very very sneaky! This was the type of addict my uncles were (although the only smell then was stale cigarette smoke), spending all day in the bookmakers studying the form, the horses and so on. It was a culture, especially back in the 1970s and 80s then the casinos etc came in. I used to waste my money on poker machines, before realizing that I had to give up as the money wasted was actually my drinking money! 🙂 lol So I guess I like stretching my buzz out a bit longer eh?